It has seven years since Himanshu Sahu booked an apartment in Gurgaon. He is yet to get possession. Sahu, Sameer Yogi, Deepak Gupta, Ranju Anthony and many others had booked apartments in “The Meadows" in sector 76 in October 2008. The project is being developed by Emaar MGF Land Ltd (a joint venture between Emaar Properties PJSC of Dubai and MGF Developments Ltd of India). In June 2009, the home buyers were informed that the project was being shelved and those who had booked apartments in it were given the option of either shifting to another project or taking their money back. Most chose to shift, and their bookings were transferred to another project called “The Enclave" in sector 66, Gurgaon. The developer promised possession of the new project in 24 months after commencement of construction. But it also mentioned that there may be a delay of six months in handing over possession, and put a clause regarding this grace period in the agreement with buyers. Construction started only after 12 months, in July 2010, and accordingly, the scheduled date of giving possession became June 2012, or December 2012 with the grace period. Home buyers said that as per the payment plan, the developer had taken 85% of the cost by December 2011, but since then project work has been moving at snail’s pace. “After 30 months (including grace period) got over in December 2012, we wrote several mails individually to the developer enquiring about the status and estimated delivery time. But each time, the builder gave us a new deadline. As of now, the delay has been of almost three years since the committed date of completion. But Emaar MGF still refuses to provide any firm timeline," said Gupta, who is a banker by profession. “It seems that the developer is wilfully delaying the project and money paid by us is getting used for some other purpose. After all, where else will they get funds at such a low cost?" added Sahu. When Mint approached the developer for a response, the company’s spokesperson said in an email, “‘The Enclave’ is part of a larger group housing project, ‘The Palm Drive’. Phase one of the project has already been delivered and occupancy certificate for balance area (Phase two) has already been applied for. And we anticipate the approval shortly, to begin delivery and hand-over of units to the customers." When the home buyers got no or unsatisfactory responses from the developer, they decided to approach it jointly. “Recently, we wrote a joint letter (29 buyers signed the letter), dated 15 April 2015, to the developer seeking a meeting with the senior management, and to get an explanation on what has caused the delay and what is the future plan on the project. But they have not responded to it," said Gupta. In reply to Mint’s query in this regard, the developer’s spokesperson said in an email, “We regularly update and reply to our customers and we will respond to the letter soon." This is significant because the home buyers in this project may not be able to get compensation for the delay from now till the company offers possession, which, as per the current situation, looks like it is still a long way ahead. The reason lies in two clauses in the agreement. While one says that the builder will provide 5 per sq. ft per month as delay compensation, another mentions that if there is a delay in getting relevant certificates or permissions from authorities, no compensation will be paid. The second clause reads: “Notwithstanding anything contained hereinabove or elsewhere in this Agreement, in the event if there is delay in handing over possession due to the delay or no-receipt of the occupation certificate, completion certificate and/or any other permission/sanction from the competent authorities, then in such an event no such compensation or any other compensation shall be payable to the Allottee(s)." The home buyers allege that the clause is being mis-used; that the company applies for occupation certificates much in advance and uses delays or rejections to avoid paying penalty to buyers. Some of those who have booked houses in “The Enclave" project are now thinking of ways to take this forward, including going to the court. Their main demands are updated and firm information of project possession and higher and continuous compensation against delay. Many home buyers across India have taken legal recourse, and in many cases, the courts have ruled in their favour (see Doors To Knock On). The case of Emaar MGF homebuyers is hardly unique. According to PropEquity Analytics Pvt. Ltd, a realty research and analysis firm, among projects that had offered possession between 2011 and 2014 in the National Capital Region (NCR), 78%, or 669 of 856 projects, are running behind schedule. The average delay is of 30 months. In Mumbai Metropolitan Region (MMR), 45% projects are running late, and the average delay is 20 months. In Kolkata, almost 47% are delayed, and the average delay is of 18 months. In Chennai, about 27% are late, and average delay is of 14 months. Filing a case against a developer would be the last thing that a home buyer wants to do. But an endless wait to get the possession, non-payment of penalty, cost escalation, changes in project layout, and sub-standard construction are just some of the problems that compel a buyer to take such measures. Moreover, with some decisions coming in favour of homebuyers in cases against builders, more are now opting for a legal solution. While you can fight a case individually, it is better to do so in a group, along with other aggrieved persons. “Homebuyers can file a case jointly against the builder as per Section 12(1)(c) of the Consumer Protection Act, 1986, wherein they need to make the groups of buyer on the basis of payment plans opted for or similar reliefs/cause of action so that it becomes easy for the court/forum to decide the case of groups on the basis of one petition only," said Harsh Pathak, a Delhi-based lawyer, who has specialized in real estate laws, among others. Going jointly also brings down the cost of litigation, and chances of harassment. Beside that, the chance of getting a speedy decision only increases. “It is always ideal to file a case jointly before the court/forum because then the consumers’ harassment and mental agony can be shown in a strong manner," said Pathak. However, the decision of when and at what stage a case has to be filed, must be decided properly. Generally, most homebuyers remain in a dilemma: to file a case against the developer or not? Most don’t want to get involved in a long drawn legal process. Some are even scared of going against a builder. “The larger and less wholesome truth is that the current legal dispensation is ill-equipped and under-regulated to offer complete consumer protection in matters related to real estate," said Anuj Puri, chairman and country head, JLL India. But, “many examples of customers obtaining favourable decisions upon approaching consumer courts exist, and the power of these forums should not be underestimated," he added. So, if you are an aggrieved home buyer, you should not hesitate in taking legal help. “Once the due date for possession is over, the buyer should visit the site and take stock of the situation by trying to assess whether the period of delay will be negligible or considerable. If the buyer feels that delay will be considerable, it would be pointless to wait further, and she should immediately file a case," said Jehangir Gai, a Mumbai-based consumer activist. You can also approach the court for other issues as well. “When it comes to deviations from the original project plan, which can result in a shortfall of common amenities or drastic changes to the units themselves, the customer should take action as soon as these deviations come to light," said Puri. But do remember that there is a stipulated timeframe within which a case has to be filed by homebuyers. “The consumer court will not entertain a complaint after the limitation period of two years is over from the date of cause of action. Hence, the consumer has to be very alert and should immediately file a case in the consumer court. Don’t keep the matter pending," said Arun Saxena, president, International Consumer Right Protection Council. However, “with regard to real estate, since there will be a continuous cause of action, this provision (2-year timeline) may not strictly apply," said S. Saroja, director, consumer advisory and outreach, Citizen Consumer and Civic Action Group. There are different avenues that you can take. “A homebuyer can approach the consumer court, civil or criminal court, or the Competition Commission of India (CCI), depending on the nature of complaint," said Saroja. “It is important that the consumer maintains written correspondence with the builder at regular intervals during the course of construction, highlighting issues then and there, as this will be a strong point in her favour when she approaches the Consumer Fora at a later stage," said Saroja. However, before going for legal action, you should have raised the issue with the developer. “Buyers should always send a legal notice before approaching any forum or court with their grievance. They should have taken objection with the builder against violations or illegal demands by sending a letter so that evidence can be created in their favour to be produced at the time of proceedings," said Pathak. To get redressal for real estate related grievances, here are three avenues that are available to you. CONSUMER COURT: The National Consumer Dispute Redressal Commission (NCDRC), or the consumer court, especially deals with consumer grievances. It functions on the basis of the Consumer Protection Act, 1986, which defines a consumer, and provides remedies against deficient services. If a builder does not provide possession as per the schedule date, the delay is denial of “service". Such disputes or claims are termed as deficiency in rendering of service of particular standard, quality or grade. NCDRC directed Unitech Ltd to compensate home buyers against inappropriate delay by paying 12% per annum. It set aside the lower amount of R5 per sq. ft mentioned in the agreement, saying the clause was one-sided and arbitrary. CIVIL AND CRIMINAL COURT: Civil proceedings can be initiated against a developer under various circumstances. According to Harsh Pathak, a Delhi-based lawyer, “declaration in respect of ownership of apartment or office space if the developer is trying to sell to some third party with malafide intentions and to take profit of inflated market prices," is one such situation. Others can be—recovery suit against the developer to seek refund, slow or no construction going on, and misrepresentation and deficiency in services. 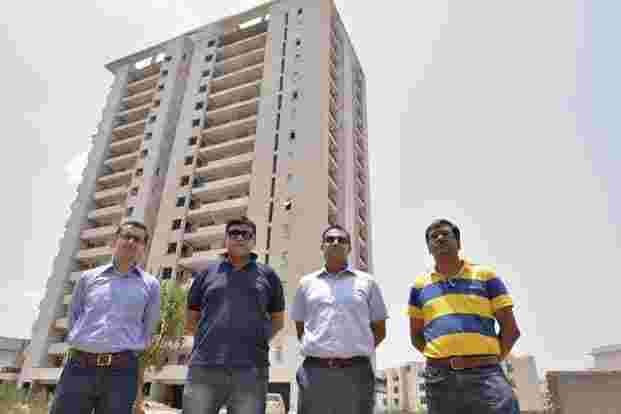 In 2014, the Allahabad High Court found Supertech Ltd guilty of violating building bylaws in residential twin towers, Apex and Ceyane, Noida. Further, the Supreme Court directed the developer to either refund the amount invested by homebuyers along with interest of 14% per annum, or offer an apartment in another project if the buyer wishes so. COMPETITION COMMISSION OF INDIA (CCI):This forum’s aim is to promote competition, stop practices that hurt competition, protect interests of consumers and ensure freedom of trade. It works on the basis of The Competition Act, 2002, as amended by the Competition (Amendment) Act, 2007. In August 2011, CCI found DLF Ltd guilty of violating fair trade norms and imposed a fine of R630 crore on it following a complaint by Belaire Owners’ Association in Gurgaon. The case is in Supreme Court at present; the developer has deposited almost the entire amount of penalty with CCI; and the final decision from the apex court is awaited.